Autumn Palette amaranth is a mix of tall, vigorous plants with flowering plumes in a wide range of colors from pale green through creamy tan to orange-brown. It makes an impression when massed in a large grouping. 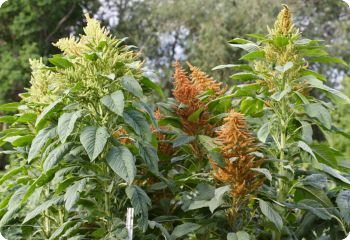 Amaranth 'Autumn Palette' begins blooming relatively early, and the flowers gradually deepen in color as autumn nears. With its large heads and plentiful seeds, Amaranth 'Autumn Palette' is a good variety for growing as a cereal grain.